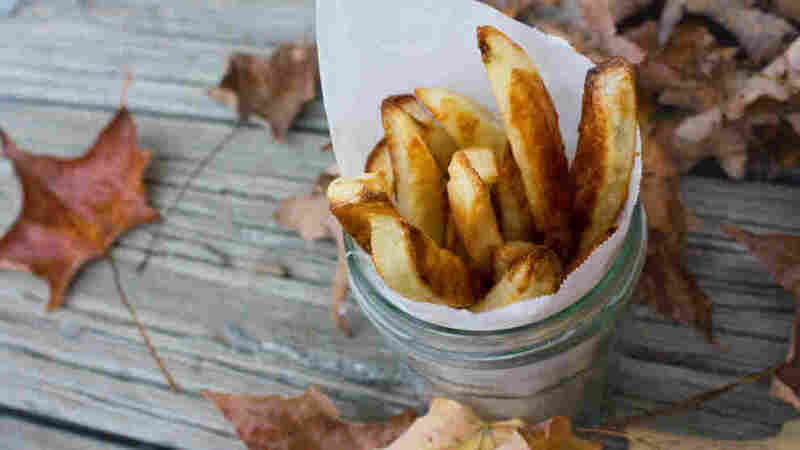 Kitchen Window -- Oven Fries: Having It Both Ways It can be hard to resist the crispy, salty temptation to "Have It Your Way," but you can ditch the fast-food fries and make your own -- in the oven. It takes a bit more time, but you won't mind when you taste your piping-hot potatoes, chicken and other favorites. Get recipes for Oven-Fried Chicken: The Weekend Version, Oven-Fried Chicken: The Weekday Version, Oven-Fried Sweet Potatoes, Oven Fries (above) and Oven-Fried Squid. Oven-frying is for those of us who tend to make peace with our cravings by surrendering to them. We still like ourselves for the fallen fools we are, but we suspect we'll like ourselves better with a streamlined figure and sleek, unclogged arteries. I don't share this with just anyone, but when I was in college I had a real weakness for fast-food french fries. This would be in the late '80s, when the beef tallow had recently been banished and the fries were now anointed with a whopping dose of trans fats. Sure, I had a student ID for an all-you-can-eat cafeteria, but like so many, I sometimes just couldn't resist the temptation to "Have It Your Way." During this period, I also worked in a darkroom bathed in formaldehyde fumes, smoked menthol cigarettes, flew regularly in my boyfriend's single-engine plane and ate half-sour pickles and frozen semisweet chocolate morsels for breakfast. I didn't worry about my weight and didn't gain any. So it may not come as a complete surprise when I say I wasn't worried about the health effects of frying. Another characteristic of being 20 is to believe you will never die and to test that hypothesis at every opportunity. In the end, of course, I surrendered to the inevitable. Adulthood made me care about my weight, and parenthood made me care about my health. Enter oven frying. Avoid big pieces. As Russ Parsons says in How to Read a French Fry, "drying is frying." You lose the evaporation versus surface-browning battle if you try to oven-fry a big, cold, wet chunk of anything. Toss it in oil. The oil does two things: It increases the browning reactions that develop flavor, and it helps increase the heat at the surface of the food (see above). Use your convection fan if you have one. The steady, high heat encourages evaporation and browning. Oven-frying is for those of us who tend to make peace with our cravings by surrendering to them. We still like ourselves for the fallen fools we are, but we suspect we'll like ourselves better with a streamlined figure and sleek, unclogged arteries. You may not be able to Have It Your Way anymore, but hey, thanks to oven frying, now you can Have It Both Ways. Of course, you could just go ahead and take your fries with a side of Lipitor. It's no picnic, though, to deep-fry at home. It's hot, dangerous, greasy work on a good day. So the question isn't why would you look for a more healthful alternative to traditional fried foods, but why wouldn't you? Fortunately, the experts have been busy answering this very question for you, though only a handful of fried foods tend to merit the oven makeover. Chicken, fish, calamari, potatoes, sweet potatoes -- in other words, starches and proteins. Sure, I like vegetable tempura and fritto misto. But trust me, no one's crying because they can't have celery fritters or deep-fried kohlrabi. T. Susan Chang is a New England-based freelance writer and a former Kellogg Food and Society Policy Fellow. She also is the regular cookbook reviewer for The Boston Globe, and her articles on cooking, gardening and nutrition appear in a variety of national and regional publications. You can find more information at her website, tsusanchang.com. Deep-frying is a delicate battle between oil and water -- the water evaporating at high speed, repelling the oil as it browns and sets the crust. When you oven-fry, you replicate that central act of deep-frying by evaporating moisture from the inside of the food and browning the outside. An oven isn't nearly as efficient as a deep fryer, so it's going to take a little longer (and sorry, folks -- chicken on the bone is going to take two steps). But with sufficiently small pieces of food, sufficiently high heat and a bit of surface oil, the switcheroo can just about be pulled off. Some oven-frying recipes need a stovetop step in addition to an oven step. For chicken on the bone, shallow frying sets the crust, and the oven cooks the interior through. For oven-fried potatoes, steaming cooks the interior first, and oven frying sets the crust. Having it both ways sometimes means having to cook it both ways, too. But one of the conditions of surviving your youth is that you no longer take your luck for granted. You won't mind the extra step when you taste your fries: piping hot, mostly guiltless and liberally seasoned with the wisdom that comes with adulthood. 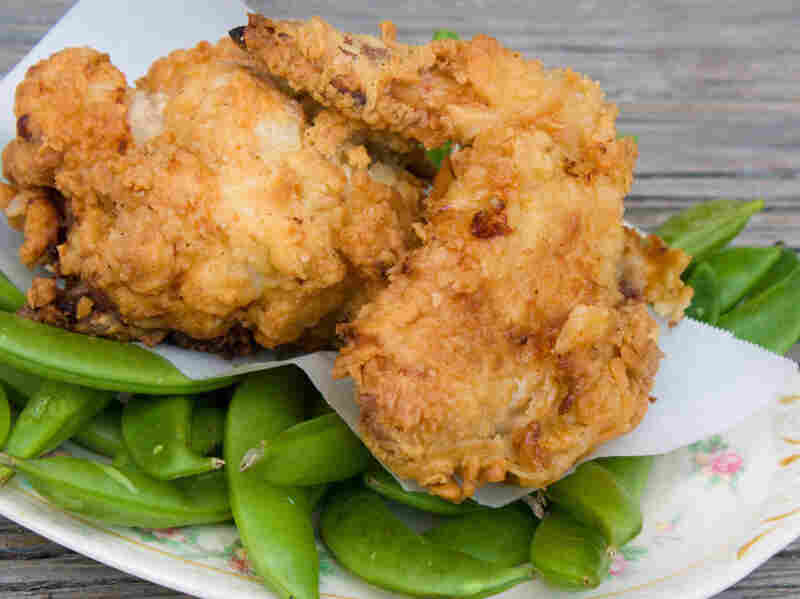 This is a fried-chicken compromise: shallow-frying in an inch of oil, followed by baking. Once you've done the initial frying, the oven's high heat keeps sizzling the oil on the skin, so you get a fine crust. Is it still an ungodly mess? Well, yes. But it's not as splattery as deep-frying, it uses quite a bit less fat, and the meat cooks through perfectly every time. If you really want to up the ante, season your buttermilk marinade like a brine, with salt, garlic and/or other herbs and spices. This should be started the day before serving. The recipe is adapted from Ina Garten's Barefoot Contessa Family Style (Clarkson Potter 2002). Combine the flour, salt and pepper in a large bowl. Take the chicken out of the buttermilk and dredge each piece thoroughly in the flour mixture. Pour the oil into a large heavy-bottomed stockpot to a depth of 1 inch and heat to 360 degrees on a thermometer. Remove the chicken from the oil and place each piece on a metal baking rack set on a sheet pan. Allow the oil to return to 360 degrees before frying the next batch. When all the chicken is fried, bake for 30 to 40 minutes, until the chicken is no longer pink inside. Serve hot. Compared with deep-frying, shallow-frying (see above) is a relatively easy way to get the oil onto the protein so you can have your crust. Even easier, however, is this technique, which uses boneless, skinless breasts. An oven-fried chicken cutlet is not quite the same as on-the-bone fried chicken, but it delivers much of the same pleasure: crunchy crust, moist interior. It requires some advance preparation. Combine the buttermilk, garlic cloves and kosher salt in a sturdy zip-top plastic bag. Holding a knife parallel to a cutting board and placing your palm on each breast half, divide chicken laterally so you have 6 thin cutlets. Then pound the breasts between two sheets of plastic wrap until no more than 1/4-inch thick. Drop the pounded chicken cutlets into the buttermilk marinade. Refrigerate for at least 2 hours and up to overnight. Place the panko crumbs in a wide, shallow bowl. 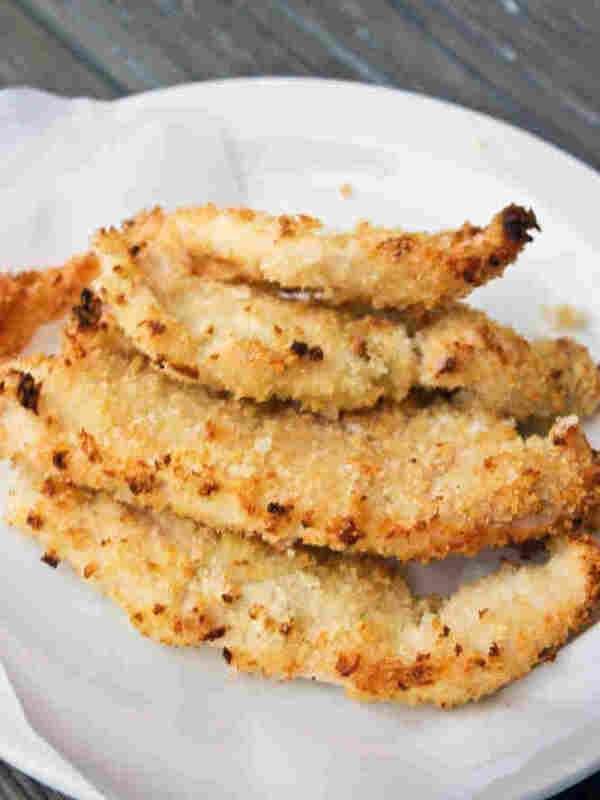 Lift a chicken cutlet out of the marinade, shake off as much marinade as you can and dredge in the panko. Place on a rack over a baking sheet. Repeat with remaining chicken pieces. In a small saucepan (one you feel comfortable holding and pouring from) on the stovetop, heat the vegetable oil until it's very hot, but just shy of smoking. Very carefully, drizzle half of the hot oil over the chicken. Carefully flip the cutlets and drizzle the remaining hot oil over the other side. Place in the hot oven, and you should quickly hear the crust start to sizzle. Bake for 20 minutes, until the crust of the chicken begins to take on a golden-brown color. Serve hot. 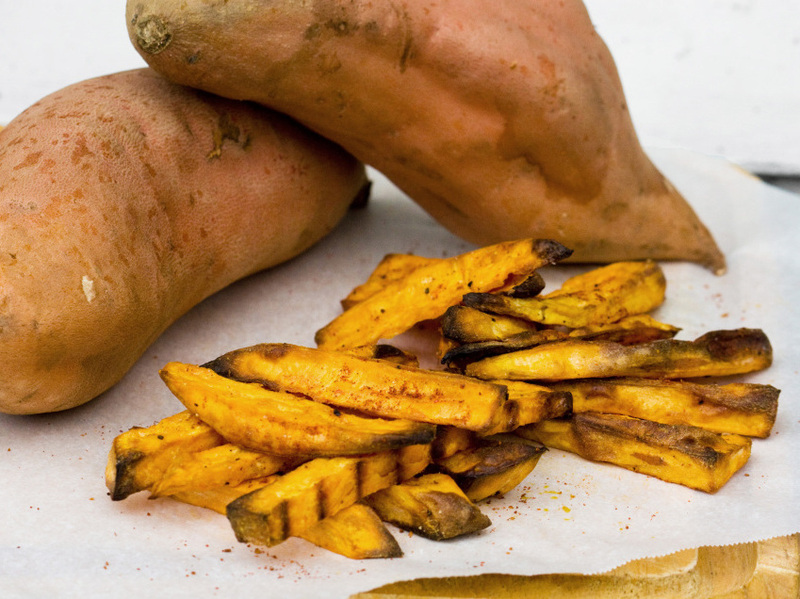 Oven-frying sweet potatoes is a challenge, because they're watery and sugary inside. Because they're watery, they simply won't form a thick, crunchy crust, and if you're not careful they'll end up soggy. Because they're sugary, they start to burn the moment all the water has evaporated from any part of the fry. That's why, so often, you get sweet potato fries that are burned on the thin end, yet soggy on the thick end. The solution is to cut them thin and even, spread them out on a rack over a baking sheet (so you have a fighting chance of crisping both sides), and watch them like a hawk at the end. A good oven-fried sweet potato will be a little chewy, with a thin, delicate crust. That happy state of affairs lasts about 10 minutes, so eat them fast. *Available at Middle Eastern grocers and online spice shops. Cut the peeled sweet potatoes into 1/2-inch slices, then cut the slices into 1/2-inch batons (alternatively, you can cut them into wedges, but the thick ends should be no more than 1/3-inch thick. You will have to endure a bit of blackening on the thin tips). Toss the sweet potatoes in a large mixing bowl with the oil, salt and pepper. Distribute them onto a baking rack set over a baking sheet. Bake for 20 to 25 minutes, until the tops start to show a bit of crust. Flip them with tongs and bake for 10 to 15 minutes more, watching closely to make sure nothing burns. Taste for salt. Season with the paprika and optional cumin and sumac. Serve immediately. 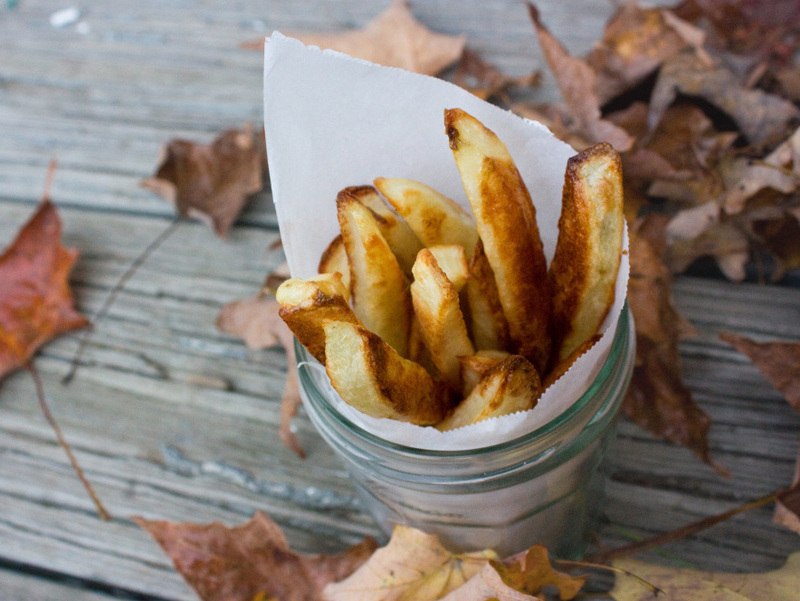 True french fries are deep-fried twice. The first frying, or "blanching," precooks the interior. The second one sets the crust. This two-step recipe adapted from Perfect Vegetables, by the editors of Cooks Illustrated (America's Test Kitchen 2003), achieves a remarkably similar result by first steaming, then baking. Although the original recipe doesn't ask you to, I find you get the best results if you bake just a little bit longer and turn each of the fries over, halfway through, with your tongs. A little more trouble, yes, but oh so worth it. This is adapted from a Steve Raichlen recipe that appears in Ellen Haas' Fast and Fit (Hatherleigh Press 2006). It is surprisingly light and crispy, although it hasn't got the decadent all-around coating of deep-fried calamari. I've altered the technique a bit, because individually dipping each piece of squid, as the original recipe suggests, will make you completely crazy. If you don't mind using a bit more flour and cornmeal, you can do this much more easily using nothing more than a baking rack to sift and drain the squid as you work. Cut the squid bodies widthwise into 1/4-inch rings, leaving the tentacles whole. Blot dry with paper towels. Season the squid with salt and pepper. Place half the flour in a wide, shallow bowl and season with salt and pepper. Place the egg and whites in another bowl and beat well with a fork. Combine the remaining flour with the cornmeal in a third shallow bowl. Add salt and pepper and whisk to mix. Oil two large baking sheets, either by using 2 tablespoons of oil or spraying with cooking spray. 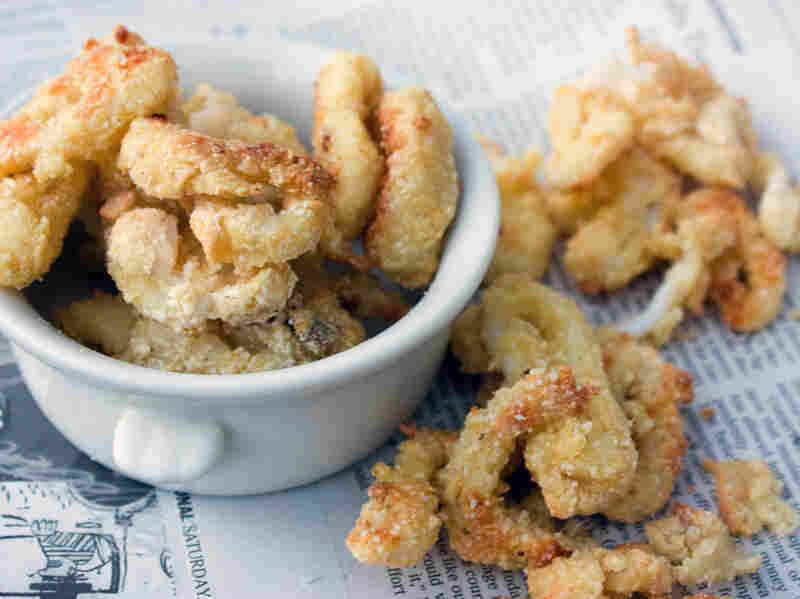 Dip the squid rings into the flour and toss with your hands. Lift them out onto a baking rack and shake the excess back into the bowl. Then drop them into the egg mixture. Lift them out with a fork onto the baking rack, and shake to drip off excess. Finally, dip into the cornmeal, again shaking off the excess, using the baking rack. Place the squid in a single layer on the baking sheets. Repeat with the tentacles. Drizzle the remaining oil on top. Bake the squid until crisp and golden brown, 8 to 10 minutes, turning with a spatula to ensure even browning. Serve at once.